I have been so submerged in the studio trying to finish a book in time for an exhibit deadline that I have barely come up for air the last two weeks. Now the book is finished and pictures sent off for jurying. Above is sneak peek; not too surprisingly, it’s about women’s mysteries. 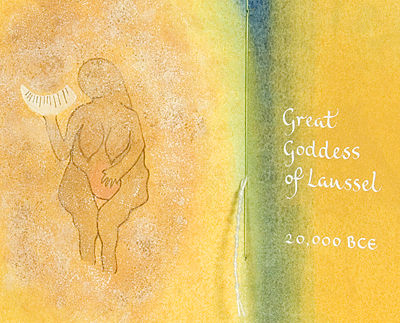 The Great Goddess of Laussel was found carved at the entrance to a limestone cave used for ceremonial purposes, stained with red ocher and dated to Paleolithic times. In her right hand she holds a crescent-shaped bison horn with thirteen notches; with her left she points to her swelling womb. Our ancestors understood the connection between the lunar phases and women’s fertility. Just before going into intense production mode in mid-February, I attended a few days of Pantheacon here in San Jose, and enjoyed all the pagan flair, costumery, and ceremony. I also enjoyed meeting some wonderful women including Selena Fox, who spoke on behalf of my books so generously on a panel discussion at the Sacred Texts, Contemporary Forms exhibit at MIAD two years ago. I was also so very pleased to see one of my first teachers, JoAnna Medina, Mama Silverwitch. One morning I attended a righteously good ritual by CAYA coven called Wake Up to Spirit, and had a wonderful time plugging in to some marvelous energy. It didn’t take me long to find my favorite vendors and presenters: two women who work with the old goddess imagery. The first was Constance Tippett, who made not only the very illuminating Goddess Timeline, but who also, upon discovering all of these ancient feminine figurines, just had to get her hands around them in clay. A woman after my own heart. She is a wonderful source of goddess statuary. And the Goddess Timeline is a real eye-opener; to see how the many goddesses stack up in the long sweep of history is to see how really short a time the Abrahamists have held sway. 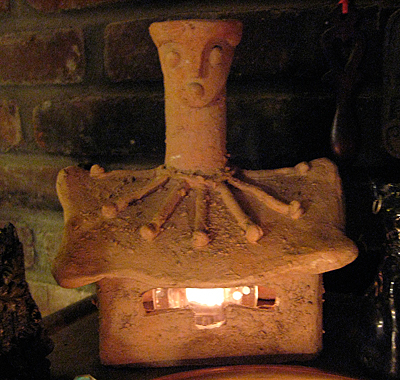 Below is a photo of the “house goddess” I bought from her last year and which has pride of place on my altar. Not only does she represent hearth and home, but she reminds me to straighten up and stretch out my chronically hunched neck! It took me a while to understand why I responded so intensely to this statue, until I got out my copy of Marija Gimbutas’ Civilization of the Goddess last week and saw the goddess on the cover. This book has been endlessly inspiring to my work over the last several years. The other artist I was excited to meet up with this year is Max Dashu. Her Suppressed Histories Archives represent years of scholarship into figures of female power around the world, and really has a global perspective. I used to follow her work years ago on the old Women’s Spirituality listserve, so I was very happy to meet her in person, and to attend both of her slide lectures. Particularly gratifying was the very full audience she had for “Goddesses, Snakes, and Chimeric Beasts in Ancient Iran.” Seems the pagan community, at least, is interested in learning about this fascinating ancient culture, a welcome change in the midst of all the saber-rattling we are getting from the warmongers in this country. I lived in Iran as a teenager and feel a great fondness for that country and its people, but that’s another story. 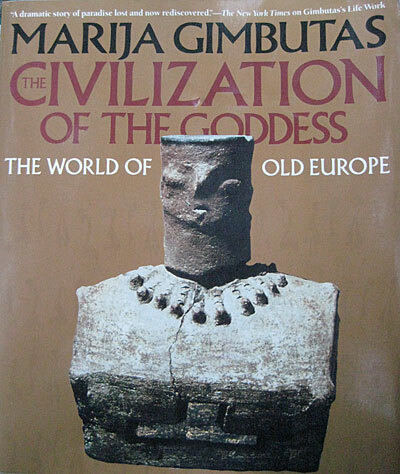 For an in-depth essay about the influence of the work of Marija Gimbutas on my work, in particular The Civilization of the Goddess, here is a link to the essay, published in 2010.